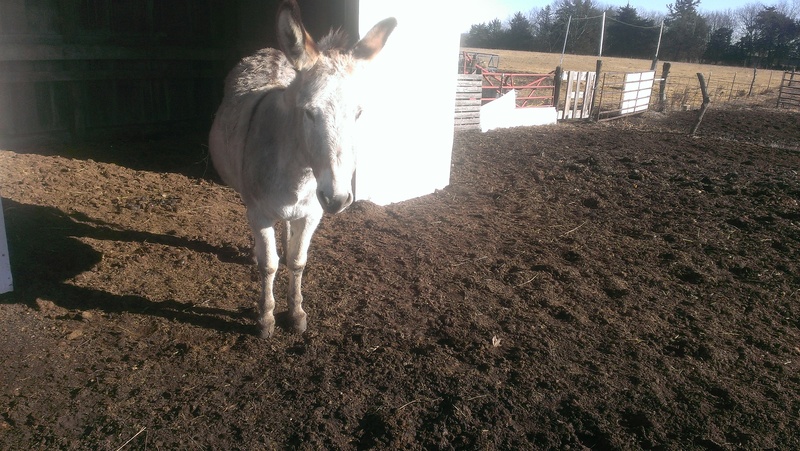 I had been posting quite a bit about the cows, so I thought I would post about my beloved horses and donkey. Mostly about the horses. 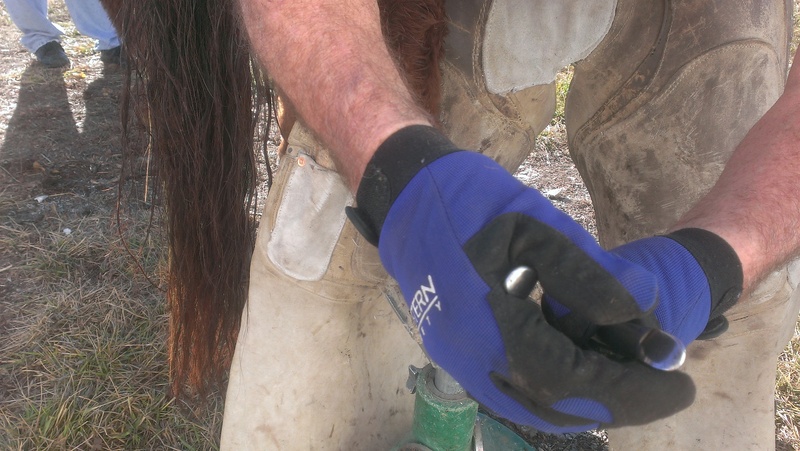 Horses need their nails (aka: feet) cleaned and trimmed just like some of us like to do. Although they don’t get the full pedicure thing. 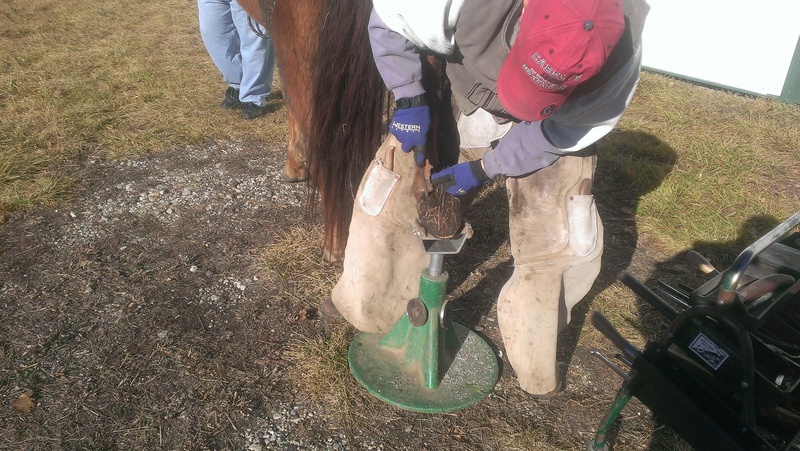 My farrier came about December 8, to trim the horses feet. I decided to take some pictures and am finally getting them posted. 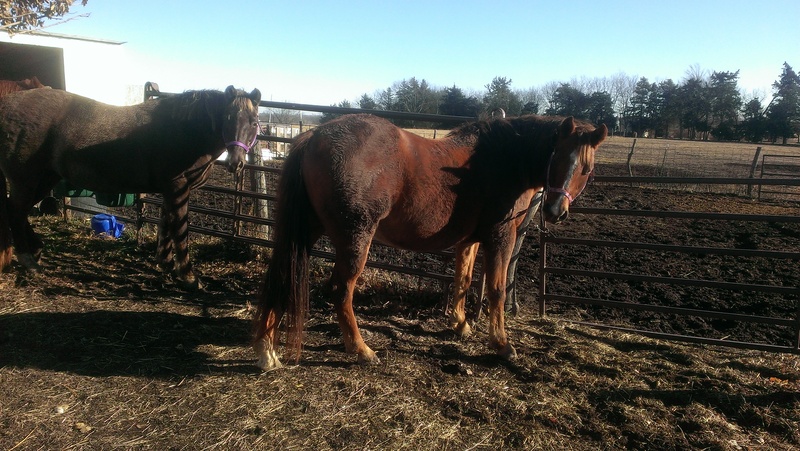 If you know anything about horses and/or own any, you will know about some of this. But if you don’t then I hope this will be an interesting post for all of you. 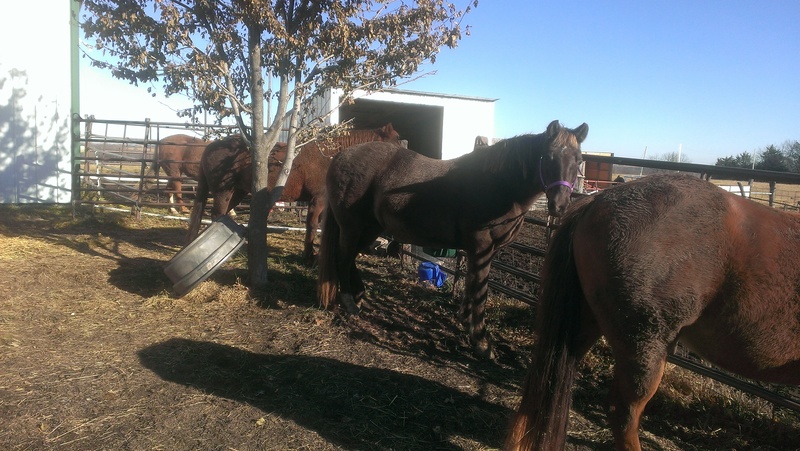 Here is the line up for that day: Wrangler and Diamond in the first picture. Wrangler in the second. Two Socks (named for her two white socks on her hind legs) in the third. I guess I forgot to get a picture of Lily. You can see her backside by the fence in the fourth picture. 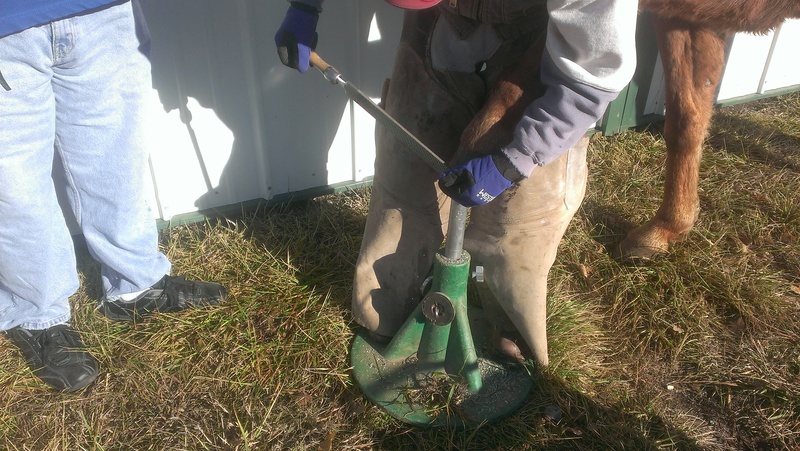 There is a variety of tools that the farrier can use. 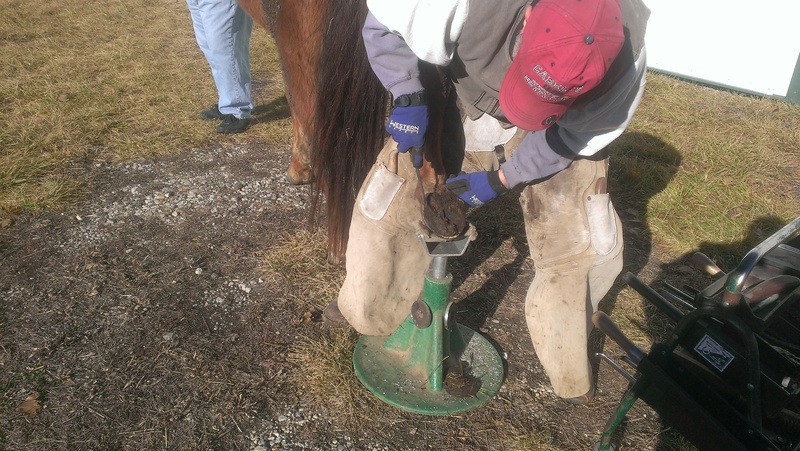 Mostly on mine he just uses a flat head screw driver to clean the horses feet instead of a hoof pick, which is what I use when I clean them out. 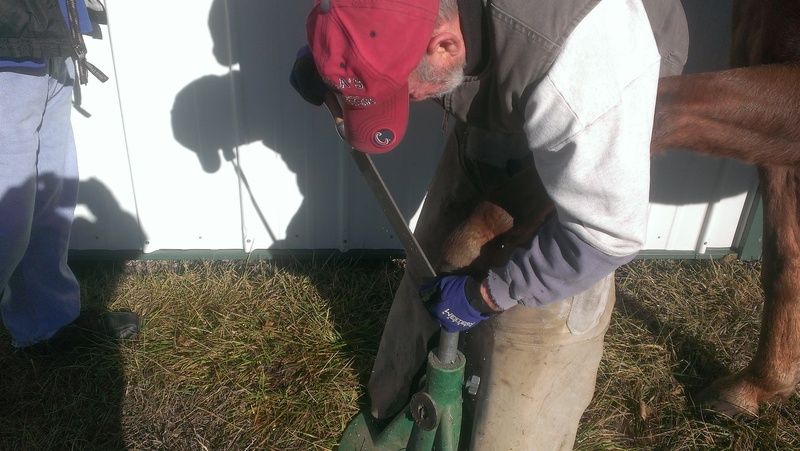 He likes the screw driver instead because it is easier to handle. 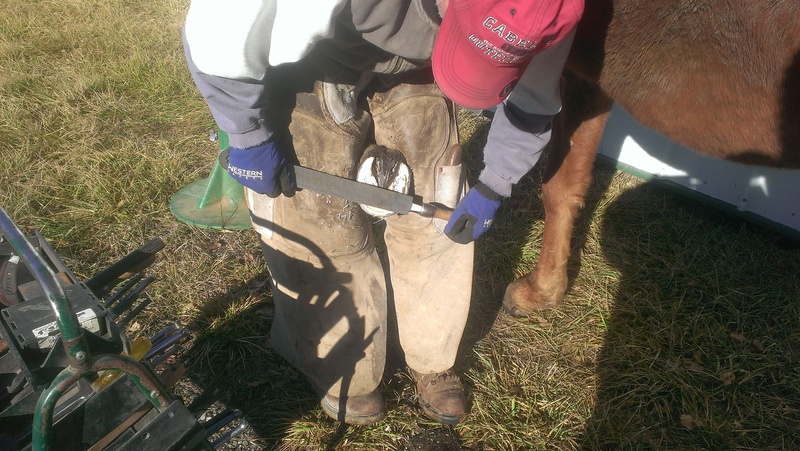 Then he uses a hoof knife to shave off the sole of the foot. It doesn’t hurt the horse as long as you are careful and don’t go too deep. 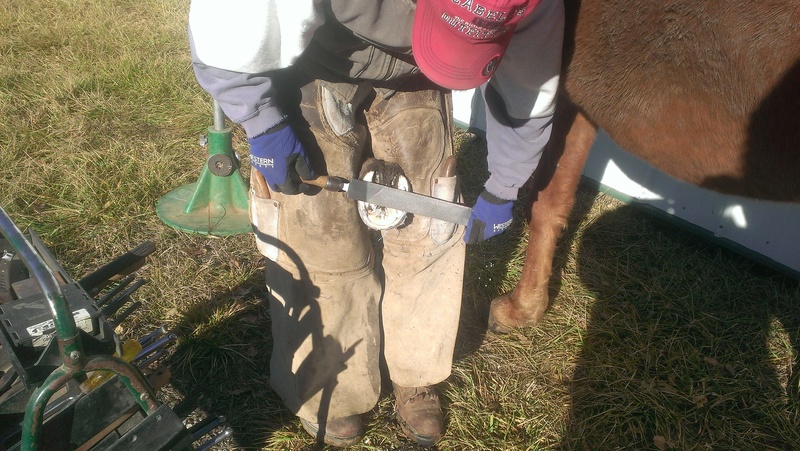 The hoof knife is very sharp and you can cut yourself if it slips. That is one reason I don’t do it myself. Plus I don’t know how much is safe to trim off. And I don’t have the strength to use the hoof nippers. 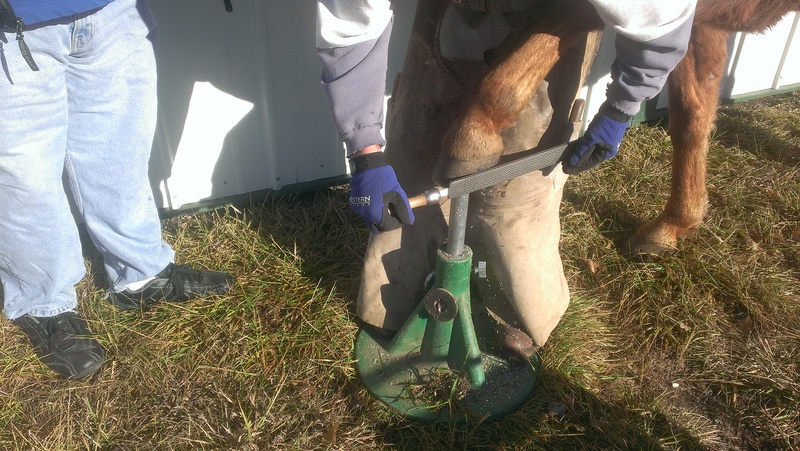 Some of these tools are for putting horseshoes on. 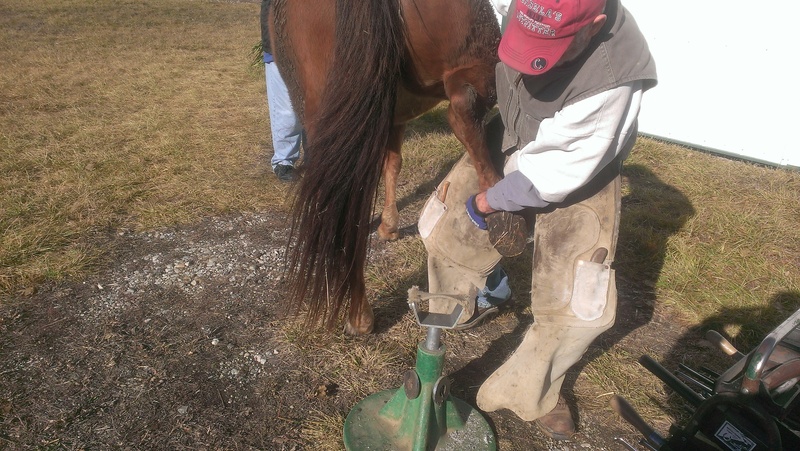 The farrier can make the shoes on site if he has to. 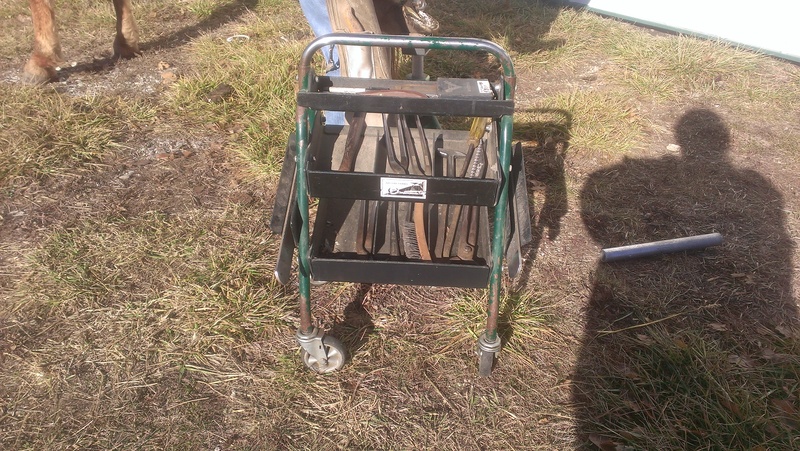 My farrier does on occasion, but he also has an array of pre made shoes of different sizes on hand. I don’t have shoes put on my horses because I can’t justify the cost. I don’t ride enough to make the price of shoes pay. 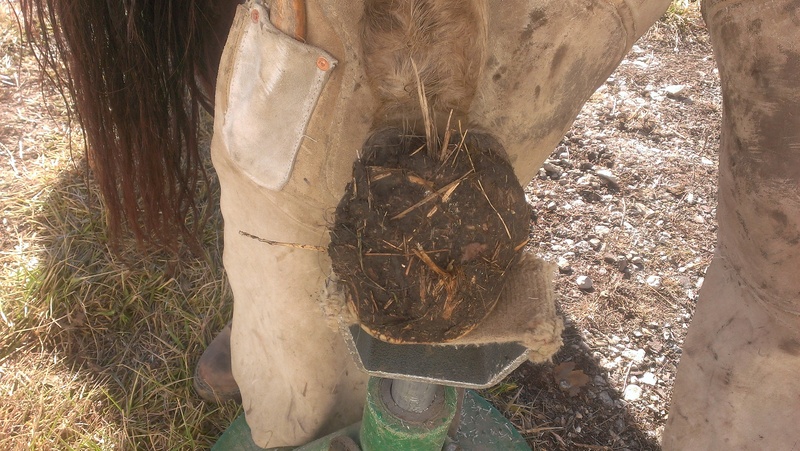 It costs about $35 per horse just to trim. Shoes are much higher. 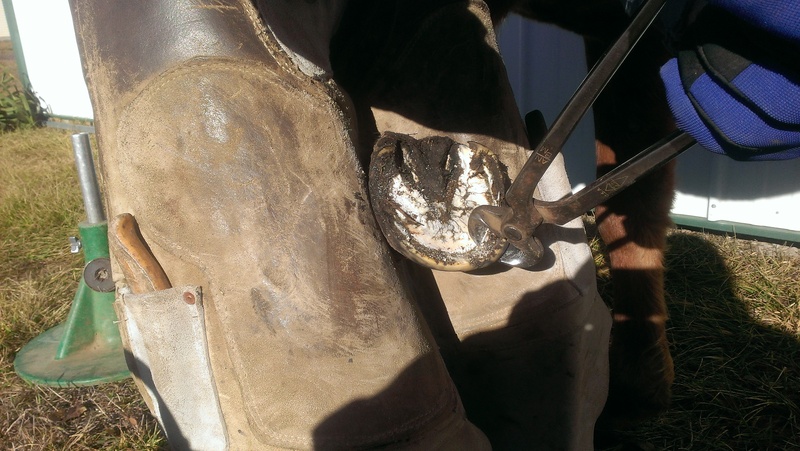 I am not sure what my farrier charges for shoes, but I am thinking it is around $60 and up. Depending on whether you just put on two shoes or four. 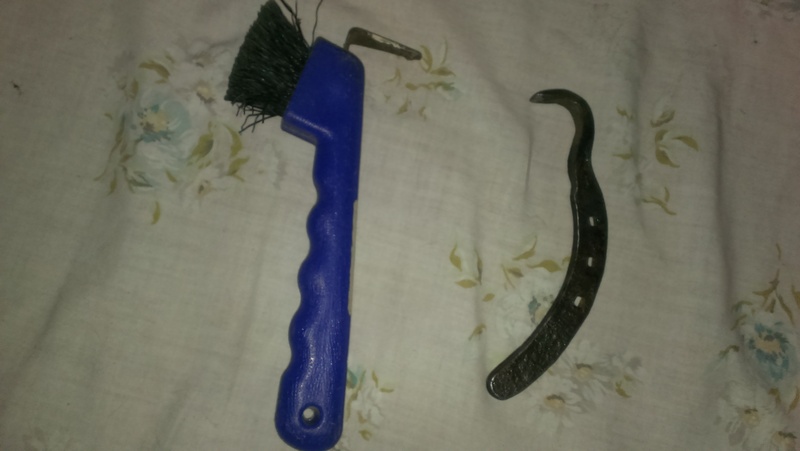 These are my hoof picks. The one on the right is made from an old horseshoe. My brother made me a pair of them. 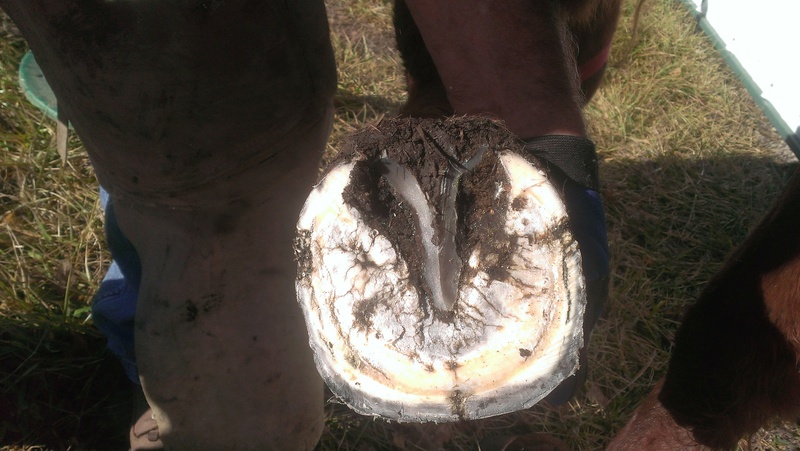 This is what the hoof pretty much looks like before it is cleaned out. This is a hind hoof. 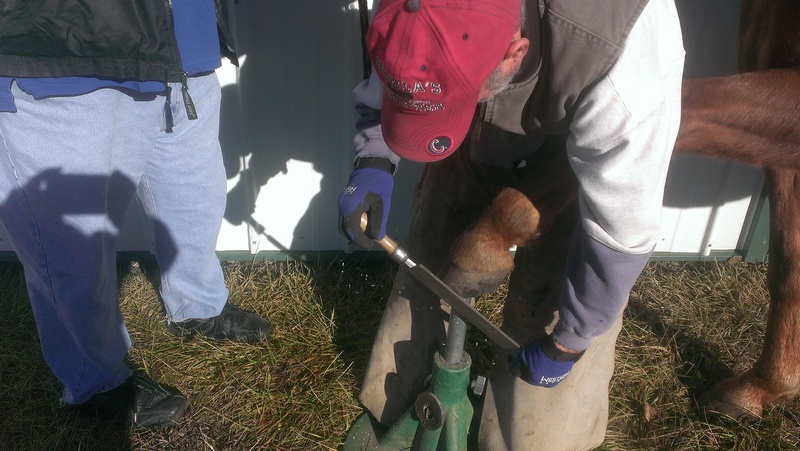 He then cleans it out with a hoof pick, or in this case the flat head screw driver. 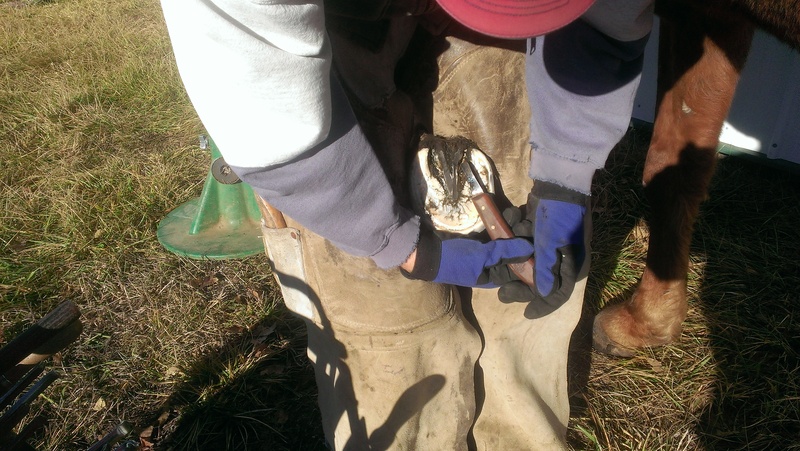 Then pares down the sole of the foot and the frog (the dark triangle) with the hoof knife. This is a front foot. I apologize for things not being in order. I was too busy snapping pictures and I am now trying to get them sort of in order. And this is what it looks like after being cleaned and pared down. 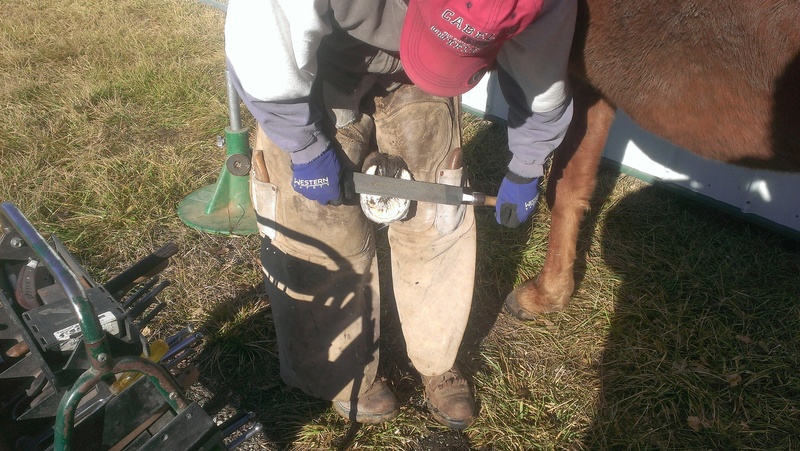 Then he trims the hoof with the nippers. 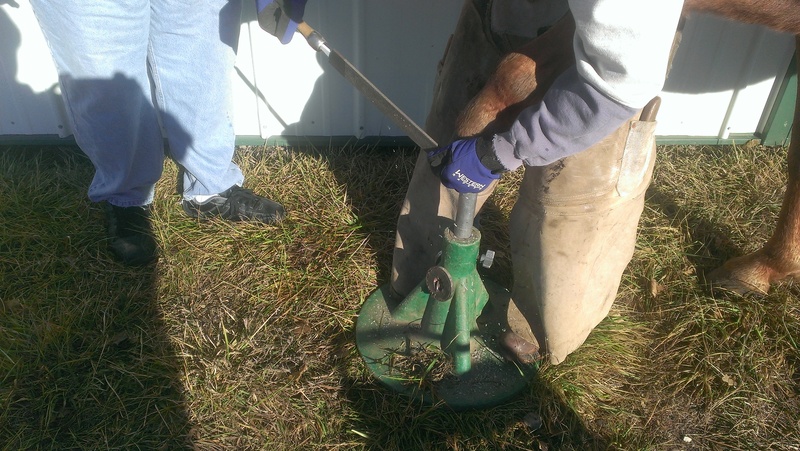 Then files the rough edges off. 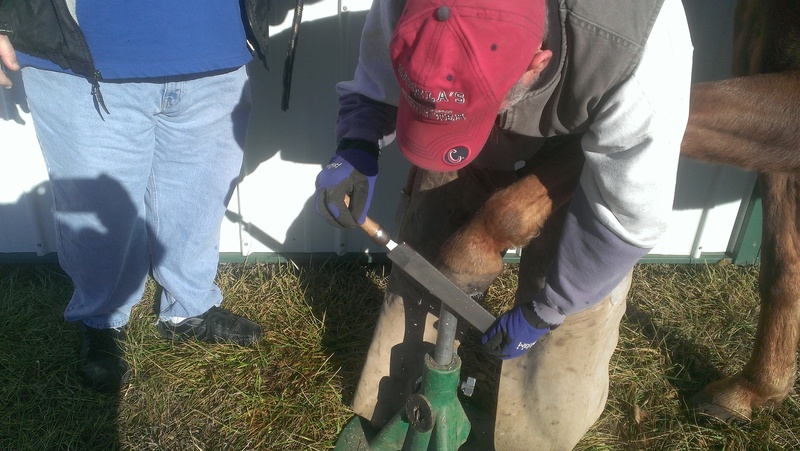 And then comes the rounding and smoothing of the top of the hoof. These are some other shots of what he was doing, and picking up the legs and feet. It is hard, back breaking work at times. And he does four horses for me. He has several customers that he does just one, and sometimes many more than four. He does all sizes too. Minis, drafts and anything in between. Jenny just gets to stand around and watch. 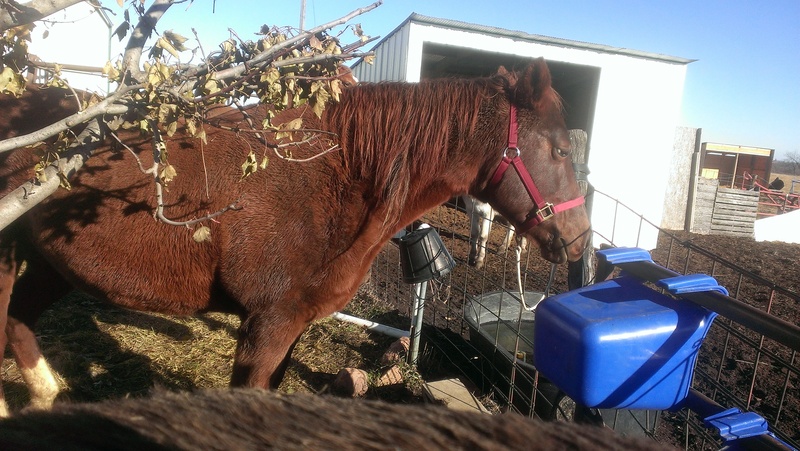 She tried to hurt my farrier the last time he tried to do her feet. 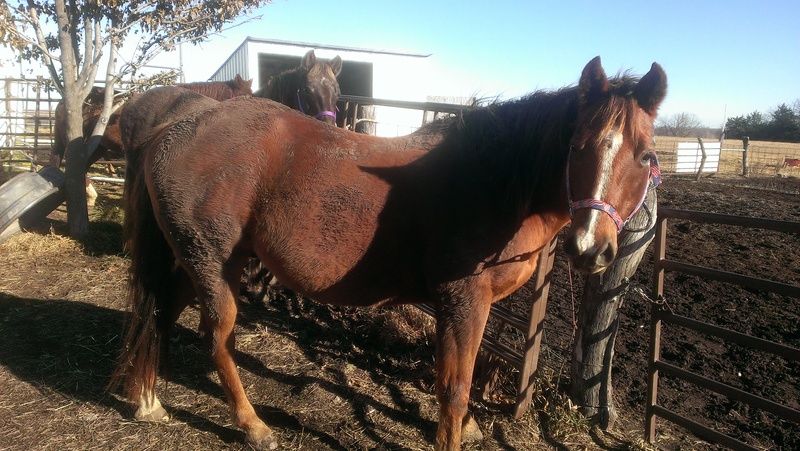 She is not totally halter broke and she mistrusts a lot of people. She reared and pinned him to the fence which earned her a good wallop with the nippers. So she doesn’t get her feet done. Thankfully she wears them off naturally. I can pick her feet up, but I don’t have the strength to trim her feet. 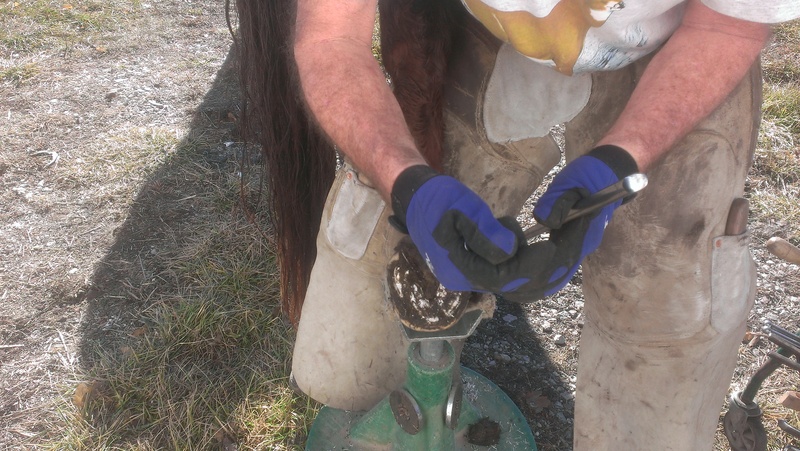 I can clean them with my hoof pick, but that’s about it. I do have a rasp. I may have to just work with her and file her feet now and then. 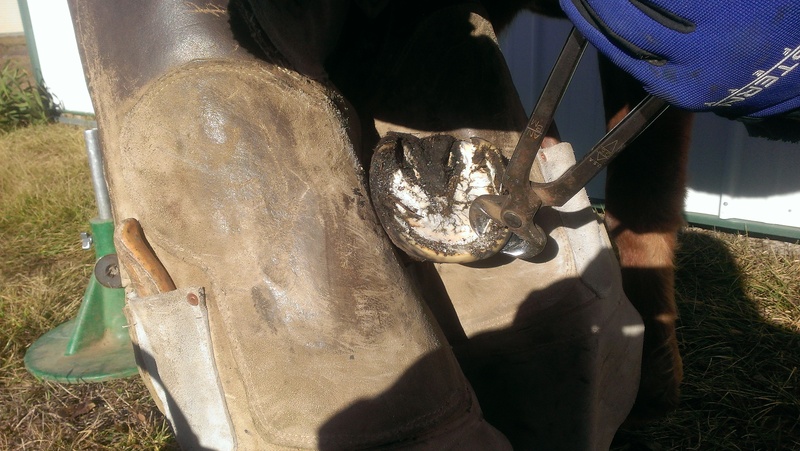 Well, that is the day of a farrier. It takes about two hours to do my four. Of course that includes breaks in between getting a horse back in the pen, chatting, and story telling. And sometimes getting a horse to behave and stand still. My son was helping hold horses while I took pictures. She’s adorable. 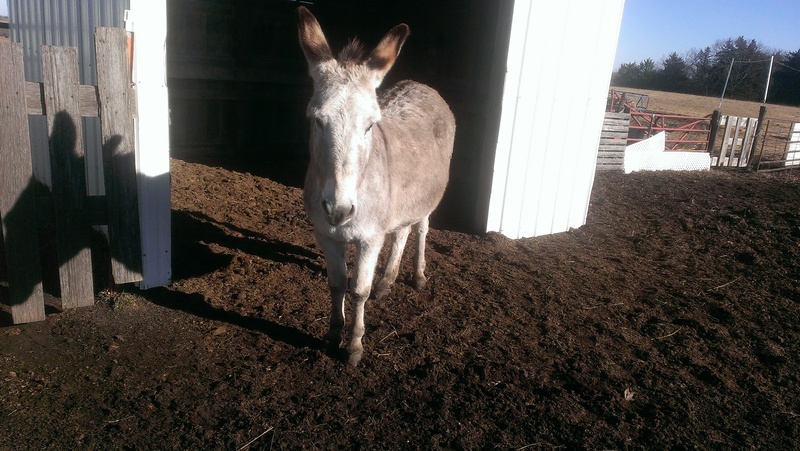 Sometimes it’s hard to tell the donkey’s from the small mules. I just went to the donkey symposium at Davis. Learned a lot about donkeys (also watched the special donkey farrier work his magic. Even HE got kicked a few times, little dudes are quick, lol). Boy can I relate to this. 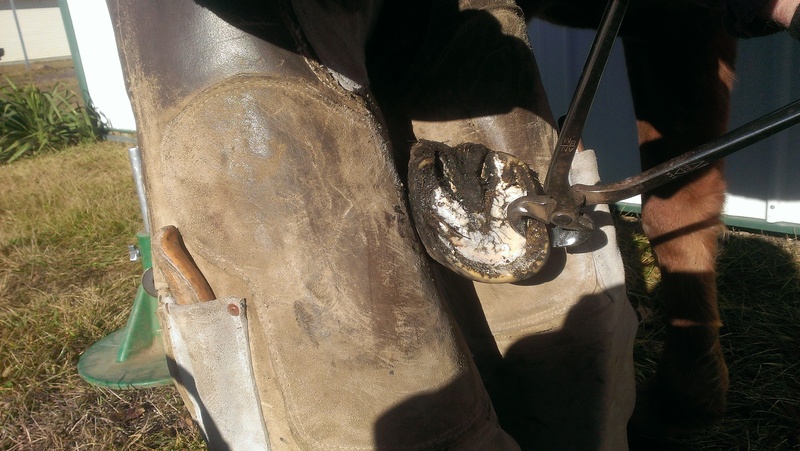 I’ve spent many a cold afternoon holding horses while my farrier sweats underneath them. Love your mule. She’s such a cutie even if she’s not a fan of the horseshoer, lol.